General manager Jason Licht said Jones has impressed the new coaching staff more than any other player so far this spring, Greg Auman of The Athletic reports. Coach Bruce Arians said Wednesday that he's excited to see if Jones can do some of the things with Tampa Bay that David Johnson did in the offensive scheme Arians oversaw during his tenure with the Cardinals, Scott Smith of the Buccaneers' official site reports. Jones played only one offensive snap Sunday in the Buccaneers' 34-32 loss to the Falcons. 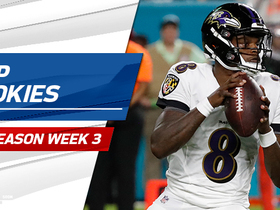 Jones brought in one of two targets for minus-2 yards in the Buccaneers' 20-12 loss to the Ravens on Sunday. Analysis: Just another forgettable game for the rookie, who's seen his first year in the NFL become a total washout. Jones' sole touch Sunday was his only one of the past two games, and he logged a meager four snaps from scrimmage for the second straight week. With his primary usage coming on coverage units, Jones has next to no fantasy value in any format. Jones saw only four snaps on offense in Sunday's 28-14 loss to the Saints but didn't log any touches. Analysis: The rookie's complete lack of involvement on offense speaks to his spot in the current pecking order. He does continue to put in time on return units, as he logged a total of 14 plays in that capacity Sunday. Given that veteran Jacquizz Rodgers has been a much more productive complementary option to starter Peyton Barber, Jones' fantasy outlook remains bleak. 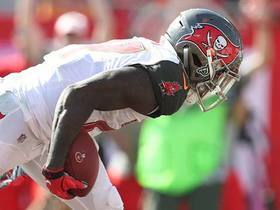 Jones rushed four times for two yards in the Buccaneers' 24-17 win over the Panthers on Sunday. Analysis: Making his return after a four-game absence, Jones essentially picked up where he'd left off, not a positive by any means in his case. The rookie's production was as middling as it was prior to his injury, and he's yet to top 3.0 yards per carry in any of the five regular-season games he's suited up for. Jones appears destined to remain firmly behind Peyton Barber in the backfield pecking order for the last four games of the regular season. Coach Dirk Koetter said Jones will play in Sunday's game against the Panthers, Scott Smith of the Buccaneers' official site reports. Jones (hamstring) wasn't listed on the Buccaneers' injury report Wednesday, Greg Auman of The Athletic reports. Analysis: Since straining his hamstring Week 8, Jones was a regular presence on those reports, missing four games in the process. With the injury behind him, he can focus on regaining a foothold in Tampa Bay's backfield, which has been dominated by Peyton Barber and Jacquizz Rodgers this season to the tune of 19.5 touches per game between the duo. Jones (hamstring) is inactive for Sunday's Week 12 tilt against the 49ers, Scott Smith of the team's official site reports. Analysis: Jones is somewhat of a surprise inactive after practicing in full all week, but given his middling production when he's suited up, the Buccaneers don't seem to have much urgency to get him back into game action. Veteran Jacquizz Rodgers should once again serve as Peyton Barber's primary backup against the 49ers. Jones (hamstring) is listed as questionable for Sunday's game against the 49ers despite logging full practices throughout the week, Greg Auman of The Athletic reports. Analysis: The practice regimen suggests Jones is healthy enough to play, but it isn't out of the question for the Bucs to essentially make him a healthy scratch. Of course, the team would be wise to give him a closer look at some point over the final six weeks of the season, considering lead back Peyton Barber is a known commodity (and an unspectacular one at that). Jones figures to get some touches if he returns for Sunday's game. Jones (hamstring) was listed as a full practice participant Wednesday. Jones (hamstring) is listed as out for Sunday's game against the Giants, Greg Auman of The Athletic reports. Jones (hamstring) took part in Friday's practice, Greg Auman of The Athletic reports. Analysis: It remains uncertain if Jones will be available Sunday against the Giants, but he has at least given himself a chance to play by taking part in each of the Buccaneers' three practice sessions this week. A better estimate of his Week 11 will status can be made when Tampa Bay releases its final injury report of the week later Friday. Jones (hamstring) was a limited participant in Thursday's practice, Carmen Vitali of the Buccaneers' official site reports. Jones (hamstring) practiced in a limited capacity Wednesday, Greg Auman of The Athletic reports. Analysis: For the first time since Oct. 28, Jones handled some practice reps as he works his way back from a hamstring injury that forced absences Weeks 9 and 10. Prior to returning to practice, the rookie told Jenna Laine of ESPN.com that his hamstring is "feeling really good." While he's taken a step in the right direction, Jones likely has to emerge from the week setback-free before gaining clearance to play Sunday versus the Giants. Jones (hamstring) will attempt to practice Wednesday, Jenna Laine of ESPN.com reports. Analysis: Jones hasn't taken the practice field since suffering a hamstring strain Oct. 28, missing two games in the meantime. Per Laine, Jones said the hamstring is "feeling really good," a sign that he's closing in on a return. Wednesday's practice report will reveal whether the 2018 second-round pick was able to suit up and participate. Jones II (hamstring) has been ruled out for Sunday's contest against the Redskins, Greg Auman of The Athletic reports. Analysis: Jones has yet to practice since straining his hamstring Oct. 28, forcing back-to-back absences so far. During the rookie running back's first DNP this past Sunday at Carolina, Peyton Barber led the Buccaneers backfield, per usual, but Jacquizz Rodgers was just behind him in terms of offensive snap count (35 versus 26). Jones (hamstring) wasn't on the field for Thursday's practice, Rick Stroud of the Tampa Bay Times reports. Jones (hamstring) didn't practice Wednesday, Greg Auman of The Athletic reports. Analysis: Jones was unable to practice in any capacity last week and isn't on the right track to avoid a multi-game absence. 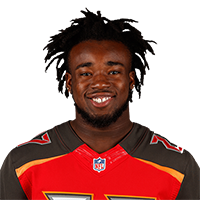 Peyton Barber (ankle) was unable to take advantage of the rookie's inactive status in Sunday's 42-28 loss to the Panthers, as the Bucs were forced to play from behind all afternoon and abandon the run game early. A Week 10 home game against the injury-riddled Redskins sets up much better for Barber to stay involved, assuming his own injury isn't a major concern. The Buccaneers ruled Jones (hamstring) out for Sunday's game against the Panthers, Scott Smith of the team's official site reports. Jones is expected to miss 1-to-2 weeks due to a hamstring injury, Rick Stroud of the Tampa Bay Times reports. Jones suffered a strained hamstring during Sunday's game against the Bengals and is expected to be sidelined for multiple weeks, Ian Rapoport of NFL Network reports. 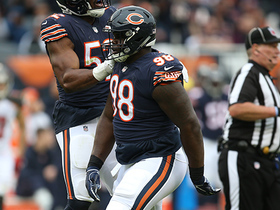 Analysis: The good news is that Jones avoided an injury of the season-ending variety, but the second-round rookie nonetheless will have his professional development stunted while he gets his hamstring back in order. Look for Peyton Barber to continue to operate as the clear lead back in the meantime, with Jacquizz Rodgers and Shaun Wilson around to help carry the load. Jones has been ruled out of Sunday's game at Cincinnati due to a hamstring injury, Greg Auman of The Athletic reports. Analysis: Jones has been incorporated into the Buccaneers offense the past four games, acting as a change-of-pace option to starter Peyton Barber. After earning 22 touches in the first three, Jones turned three touches into one yard before departing this contest. Expect Jacquizz Rodgers to handle any reps that Barber doesn't while Jones is sidelined. Jones took most of the running back reps at Wednesday's practice in the absence of Peyton Barber (undisclosed), Greg Auman of The Athletic reports. Analysis: The Tampa Bay backfield situation will require close watching leading up to Sunday's game at Cincinnati. In addition to Barber's unspecified injury, the team may simply have a desire to get Jones more involved with the offense. Undrafted rookie Shaun Wilson reportedly also had a role at Wednesday's practice. 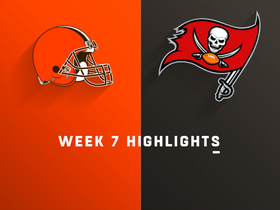 Jones rushed six times for 13 yards and a touchdown and brought in his sole target for 15 yards in the Buccaneers' 26-23 overtime win over the Browns on Sunday. 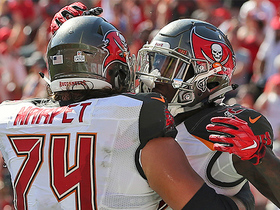 Analysis: The rookie found his way into the end zone late in the third quarter from two yards out, giving the Bucs a seemingly comfortable 23-9 lead at the time. While the fact he scored the first rushing touchdown of his career was encouraging, just as in the preseason, Jones has been unable to do much with the opportunities he's seen. Factoring in Sunday's line, he's rushed just 17 times for 45 yards over the three games he's seen action in. He'll look to improve versus the Bengals in a Week 8 matchup. Jones rushed once for three yards and brought in all three targets for 16 yards in the Buccaneers' 34-29 loss to the Falcons. Jones rushed 10 times for 29 yards and brought in one of two targets for minus-1 yard in the Buccaneers' 48-10 loss to the Bears on Sunday. Jones is active for the first time in his NFL career Week 4 against the Bears. Jones is expected to be active for Sunday's game at Chicago, Adam Schefter of ESPN reports. Analysis: The Buccaneers invested a 2018 second-round pick in Jones, only to include him among their inactives for the first three games of the season in favor of running backs Peyton Barber and Jacquizz Rodgers. Neither player has been particularly productive en route to the 30th ranked rush offense, so Jones may be tasked with jump-starting the Bucs' backfield. Still, it's difficult to envision a large workload for Jones if all three are active. Jones (coach's decision) is listed as inactive Monday versus the Steelers, Scott Smith of the Buccaneers' official site reports. Analysis: Jones' pro debut will be delayed another week following the Buccaneers' decision to deactivate him. The trend likely will continue as long as Peyton Barber and Jacquizz Rodgers remain healthy and productive. Jones' next chance to play arrives Sunday in Chicago. Jones (coach's decision) is inactive for Sunday's Week 2 tilt against the Eagles, Scott Smith of the Buccaneers' official site reports. Analysis: Jones will thus spend the first two games of his professional career on the sidelines, a result of both Peyton Barber's clear hold on the No. 1 running back role and Jones' own deficiencies in the preseason. The rookie's next chance to make his NFL debut comes in a Week 3 Monday night matchup against the Steelers. Jones (coach's decision) is inactive for Sunday's season-opening tilt against the Saints, Scott Smith of the team's official site reports. Analysis: It's the latest taste of adversity for the 2018 second-round pick, who struggled to find any running room throughout the preseason and saw Peyton Barber unequivocally take the reins of the No. 1 running back job in the process. However, Sunday's inactive status also signifies that veteran Jacquizz Rodgers is the preferred game day option to start the season, adding further disappointment to the early portion of Jones' NFL career. 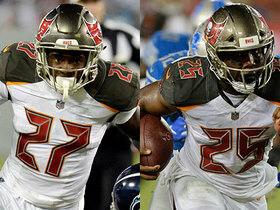 Jones is listed as the Buccaneers' third running back behind Peyton Barber and Jacquizz Rodgers on the initial version of the regular-season depth chart, Rick Stroud of the Tampa Bay Times reports. Coach Dirk Koetter said Jones doesn't have any issues with effort or knowledge of the playbook, Rick Stroud of the Tampa Bay Times reports. "When his runs came up, we didn't block them very well, number one, and he wasn't able to do much with it on his own," Koetter said. "I know from Ronald's standpoint, it's not at all from lack of effort, or from him not knowing what he's doing." Jones took 10 carries for four yards and didn't draw any targets in Thursday's preseason game against Jacksonville. Jones had six carries for seven yards and one reception for 37 yards in Friday's preseason game against the Lions. Jones' struggles with drops during practice haven't gone unnoticed by the Tampa Bay coaching staff, ESPN.com's Jenna Laine reports. "In college, there was probably a reason why [Jones] was only thrown the ball 17 times," said Bucs running backs coach Tim Spencer. "He's never going to be the best catching guy on the team, but he certainly can improve on catching the balls that we want to throw to him." Jones rushed four times for two yards and failed to come up with his only target in the Buccaneers' 30-14 preseason win over the Titans on Saturday. Peyton Barber seems to have an early edge over Jones, Rick Stroud of The Tampa Bay Times reports. "Peyton is our starter," Buccaneers coach Dirk Koetter said Monday. "We're definitely going to use Ronald Jones and take advantage of what he's going to do. We do have the two veteran backs behind him. Again, we've got three more preseason games. Let's just let it sort out a little more." Jones rushed eight times for nine yards and a touchdown and failed to come up with his only target in the Buccaneers' 26-24 preseason win over the Dolphins on Thursday. Jones has struggled with pass protection during training camp, Rick Stroud of the Tampa Bay Times reports. Jones has been receiving first-team reps since Friday's practice and has looked the part of a starting running back, Carmen Vitali of the team's official site reports. Jones signed his rookie contract Thursday, Scott Smith of the team's official site reports. 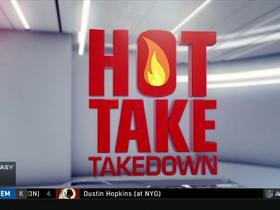 NFL Network's Adam Rank and Marcus Grant battle with their hot takes for Week 8. 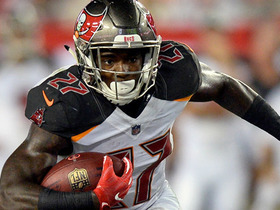 Tampa Bay Buccaneers running back Ronald Jones breaks through for first NFL touchdown. Tampa Bay Buccaneers running back Ronald Jones races to first down after short catch. Tampa Bay Buccaneers running back Ronald Jones holds onto the ball tight and runs hard straight up the middle on his first NFL carry. NFL Network's Terrell Davis and Lindsay Rhodes discuss which running back should start for the Tampa Bay Buccaneers for week one of the regular season.